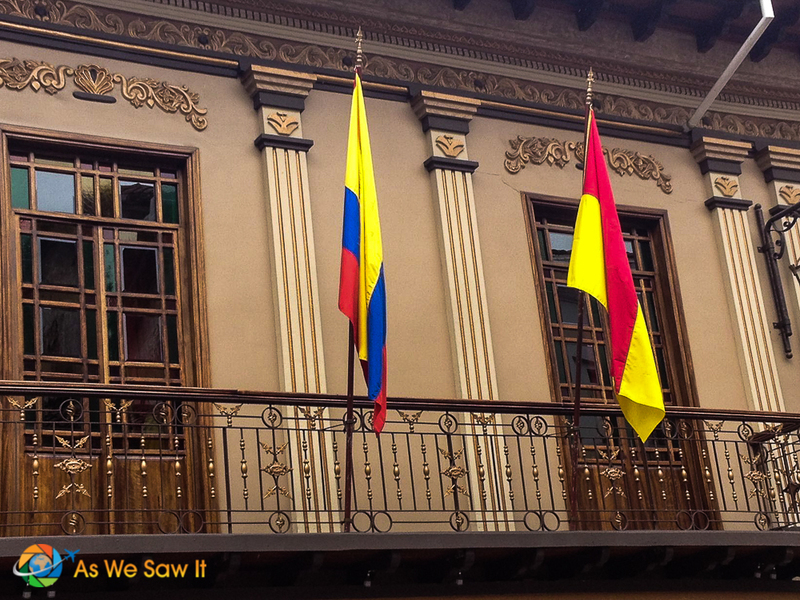 Walk down any street and look up: You'll see amazing architectural details on the balconies in Cuenca, with plenty of eye-popping color and details in the iron and woodwork. No wonder this is a UNESCO city. I had a desperate need to grab the Big C's – you know, coffee and cash – so I went out for a walk. I decided to head down Simon Bolivar to the Banco Pichincha on the corner of Remingo Crespo and Mariscal Sucre. This is only about an eight block walk from our home. 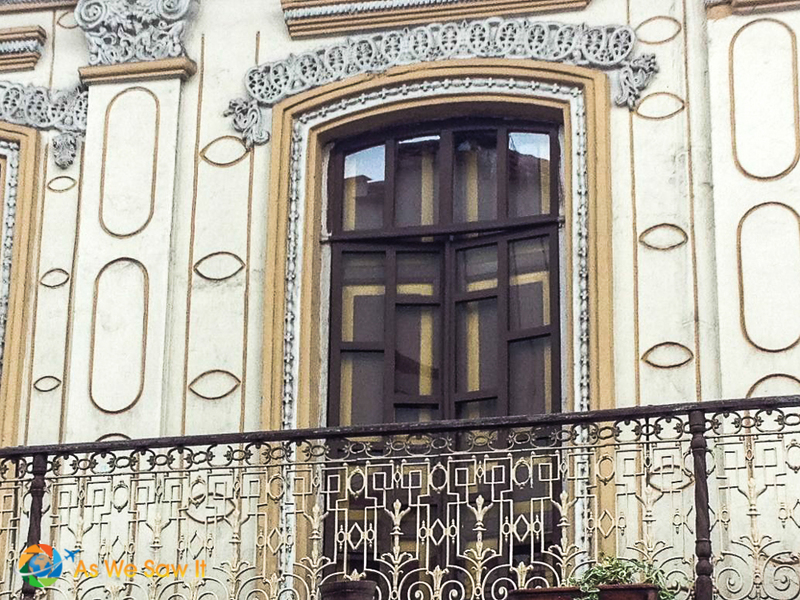 So, iPhone in hand, I decided to explore Cuenca's streets to search for its colonial balconies and take a closer look at the intricate wrought ironwork. Here is what I found. Notice the details in the ironwork and the columns alongside the doorway. 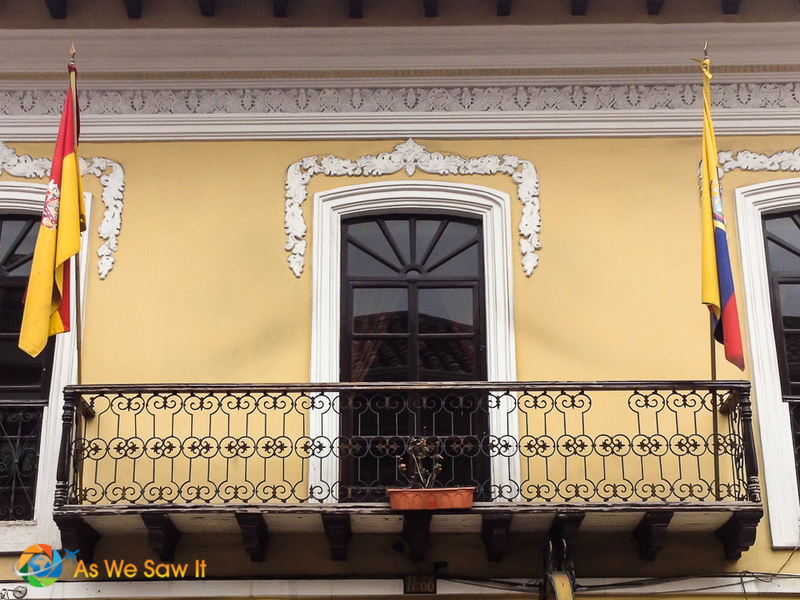 The corner balconies in Cuenca offer views down two of the city's cobbled streets. 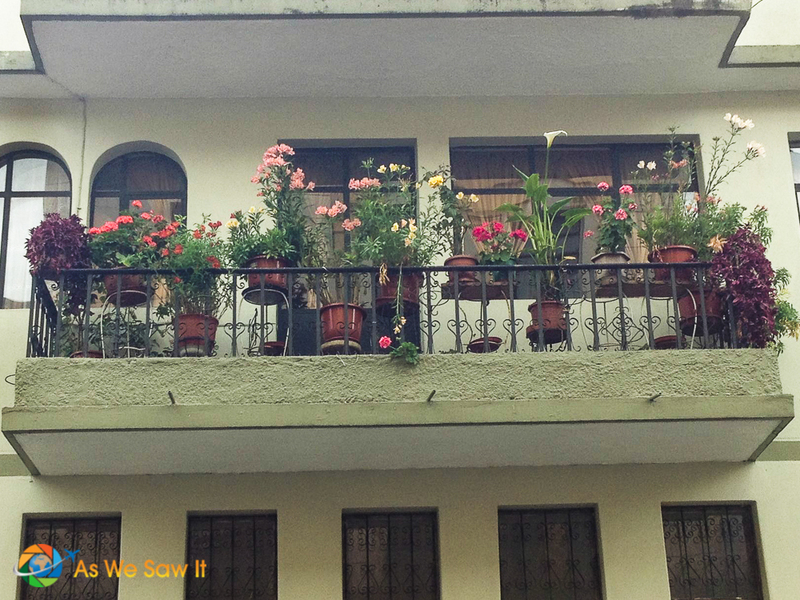 Flower baskets with full blooms brighten any balcony, like this one. Look at the intricate carved details above the doorway. The lights framing the doorway bring attention to this wrought iron balcony. 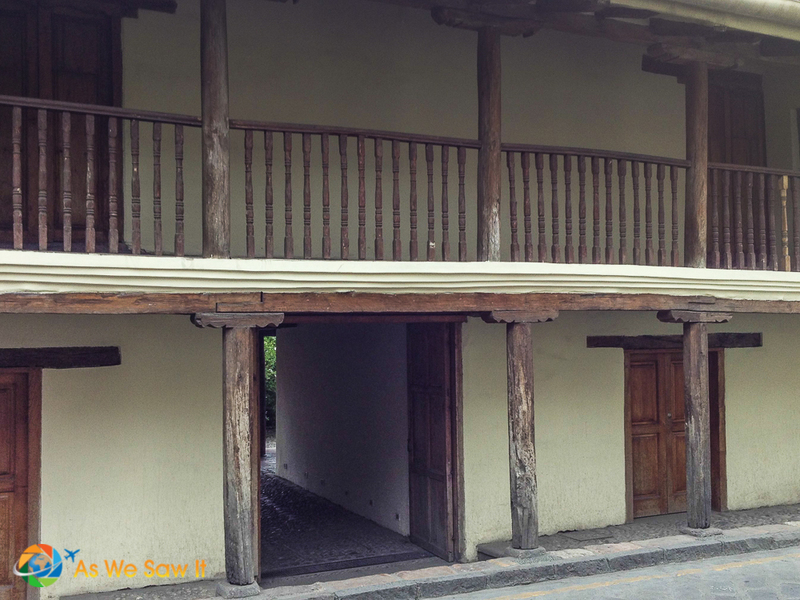 Check out the pattern above the doorway just under the eave. Flags also attract the eye. 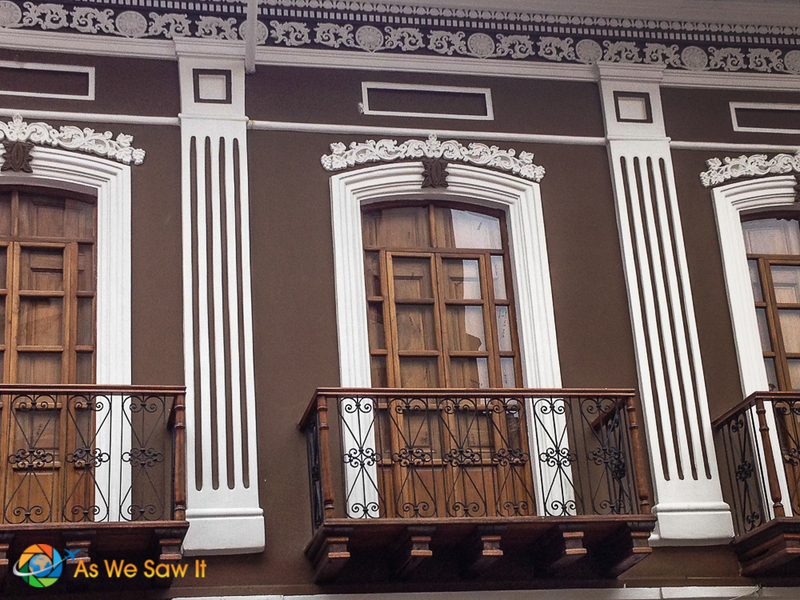 Many balconies in Cuenca have them. 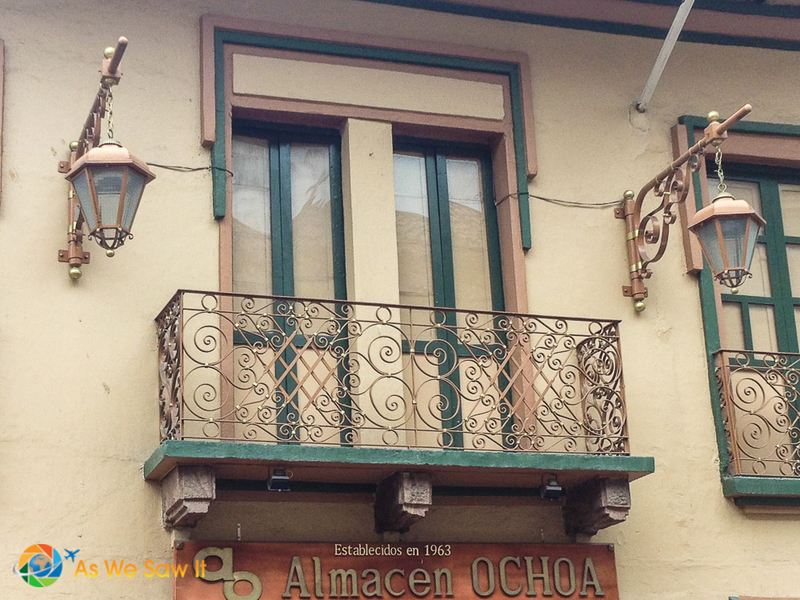 The colors just pop on this balcony in Cuenca and enhance the ironwork details and flowers. The woodwork above this door caught my eye as the white against the yellow showed the carvings nicely. 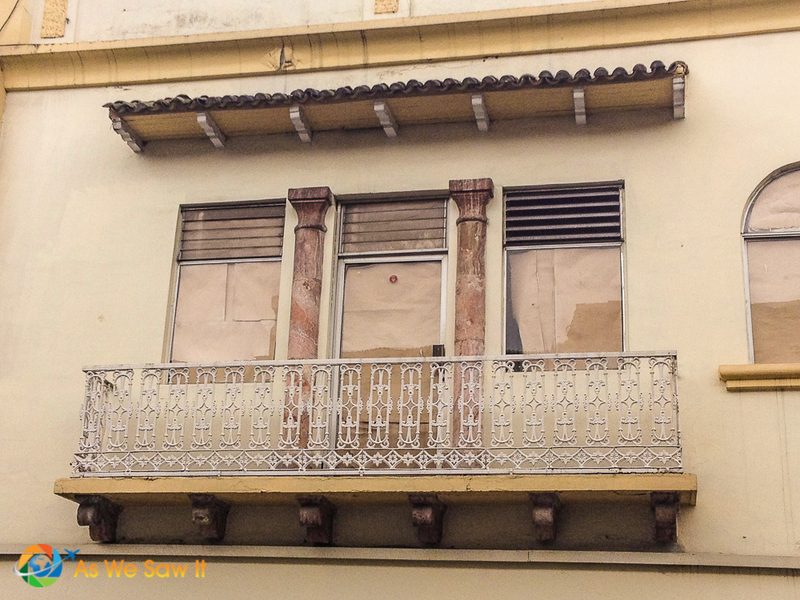 Here the owner enclosed the balcony while adding additional details. 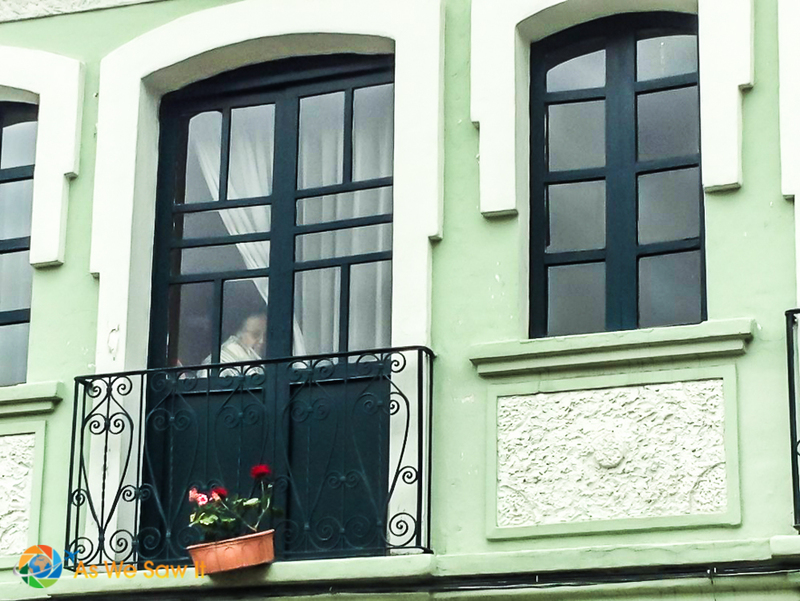 This lady enjoyed watching me take pictures of balconies from inside her Juliet balcony. 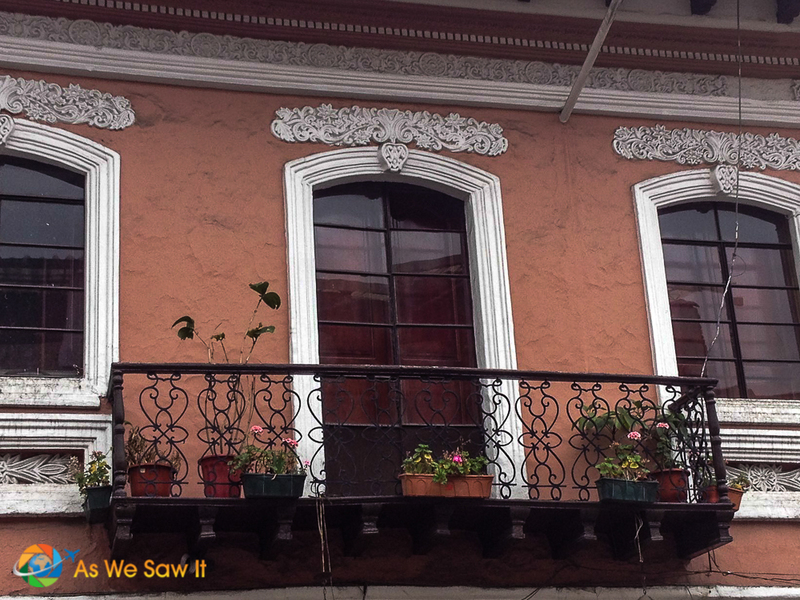 Even the oldest balconies in Cuenca have a character all their own, like this “waving” balcony. Notice the dips and rises along the span. 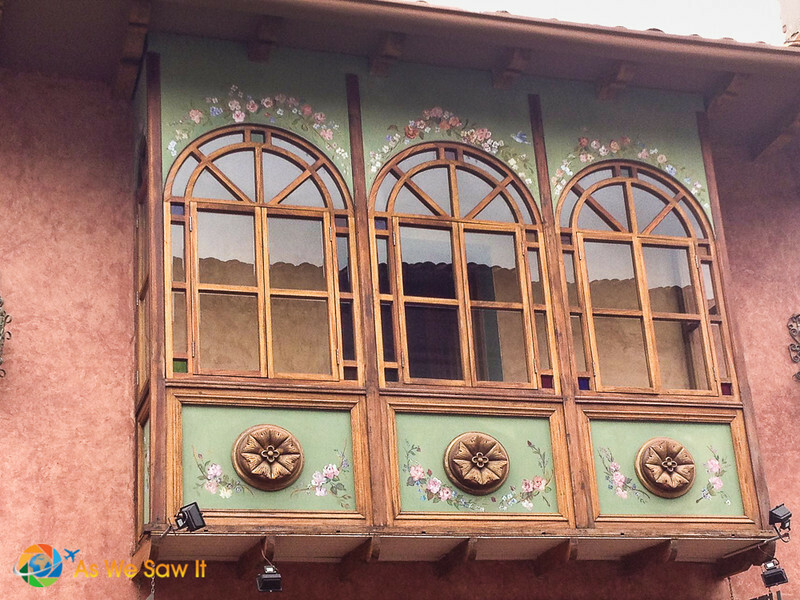 If you enjoy architectural details like this, please share this post and subscribe. I love this post. 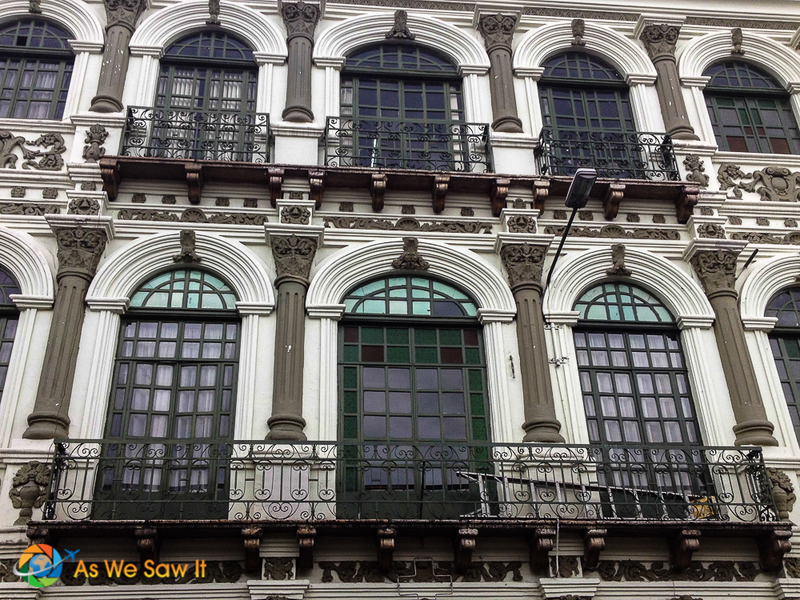 I have a bit of a thing about balconies, it is something I loved in Europe. I have never been to Ecuador, but think it should go onto my bucket list. I could roam the streets looking at the beautiful architecture for hours. Are there any balconies where you live? You’re right about the balconies in New Orleans, Arleen. They truly are beautiful. 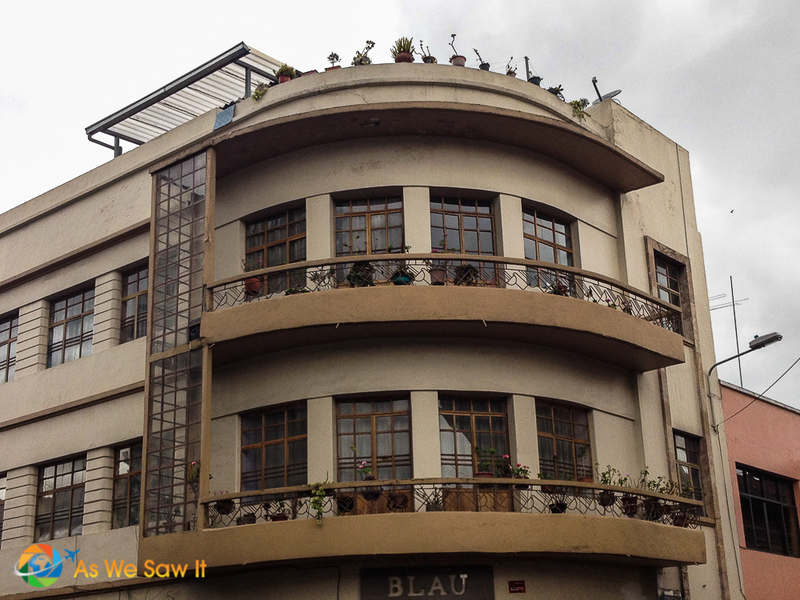 Some of these balconies have reminded us of them, especially when they’re festooned with flower boxes. These are BEAUTIFUL. I also look up when I travel, there is so much to see! Ha – I wish I could say the same, but I’ve been known to trip over nothing, so my eyes are often on the cobbled sidewalk ahead of me.